Some players have the almost inexplicable ability to win a game without doing anything whatsoever. They spot 'negligible' positional inaccuracies and outplay the opponent, usually in a long game. Little fireworks, and no crowd-pleasing business! These players know very well that an attacker will cross the limits of safety or lose patience in the face of a dour defence. From the point of view of chess, their play is based on the notion that an over-extended, broad structure has its weaknesses too. It may not be easy to maintain coordination among your pieces, particularly when they have advanced deep into the enemy territory but are not very effectively placed. This may be called pseudo-development or deployment. Modern chess theory treats the concept of development a bit differently. It's not enough to develop your pieces; the most important thing is whether they are working in perfect harmony with each other and creating lethal threats. Else, they will have to retreat at some stage, losing valuable time. One modern player whose play had a truly mystic quality was Tigran Petrosian (world champion 1963-69). Petrosian had a style not easy to describe. 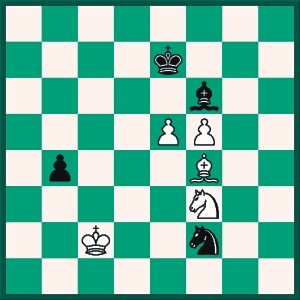 He would follow the opening theory, like most others, but in the early middle game, he would invariably start a regrouping which often appeared to be rather enigmatic. A chess commentator once said, "Petrosian can be dangerous from the back rank". That defined the Armenian world champion's original style and ideas in one sentence. As a player, he was often misunderstood for two reasons. First, his subtle play did not have much appeal to the average chess fan. Even a master of Rueben Fine's stature described Petrosian as the weakest ever (!) world champion. Second, Petrosian came under the shadow of Bobby Fischer who was playing marvellous chess in the sixties. I think Fine did gross injustice to the player who added an altogether new dimension to the game. There is no doubt that Petrosian's play enriched chess in many ways. Here is a game that he won against Ludek Pachman, the German player and theoretician. 1.Nf3 d5 2.g3 g6 3.Bg2 Bg7 4.d3 e5 5.00 Ne7 6.c3 00 7.Nbd2 c5 8.e4 d4 9.cxd4 cxd4 10.Nc4 Nbc6 11.a4 Be6 12.b3 f6 13.Bd2 Nc8 14.h4 h5 15.Kh2 Nd6 16.Bh3 Bg4 17.Kg2 Qd7 18.Bxg4 hxg4 19.Nh2 f5 20.Nxd6 Qxd6 21.b4 Nd8 22.b5 Rc8 23.a5 Rf7 24.Qa4 Rfc7 25.h5 Qe6 26.hxg6 fxe4 27.dxe4 Qxg6 28.Rfe1 Rc2 29.Ra2 Rxa2 30.Qxa2+ Qe6 31.Qxe6+ Nxe6 32.Nxg4 Rc5 33.Rb1 b6 34.axb6 axb6 35.Kf1 Nc7 36.Ke2 Rxb5 37.Rxb5 Nxb5 38.Kd3 Kf7 39.Kc4 Na3+ 40.Kb3 Nb5 41.Kc4 Na3+ 42.Kd3 b5 43.f4 exf4 44.gxf4 Nc4 45.Bc1 Ke6 46.Nh2 Kd6 47.Nf3 Kc5 48.Ng5 Kd6 49.f5 Ne5+ 50.Kxd4 Ng4+ 51.Kd3 b4 52.Kc2 Bf6 53.Nf3 Nf2 54.Bf4+ Ke7 55.e5 b3+ 56.Kxb3 Nd3 57.Bg3 Bg7 58.Bh4+ Kd7 59.f6 Bf8 60.Kc4 Nf4 61.Bg5 Ne6 62.Kd5 Ba3 63.Be3 1-0.